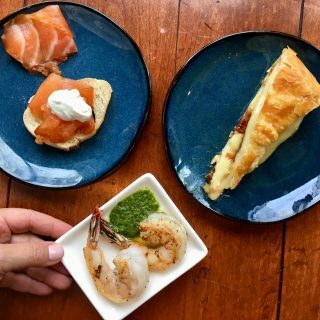 Got a party this weekend? You have to have wings. 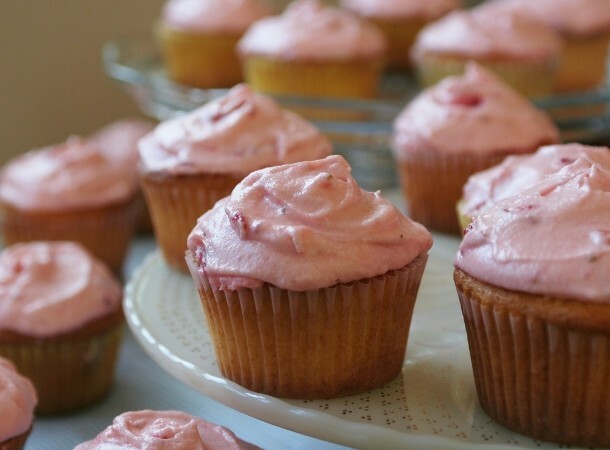 They are nearly as easy to make as they are to eat– and they get devoured. (In other words, you need a lot of them). Here’s how you know just how many “a lot” is. There are about 12 wings to a pound, but you are going to cut each wing in half, so you get 24 pieces per pound. When you get them home, cut off the wing tip (that’s the pointy piece with very little meat on it) and either throw it in a bag in the freezer to make soup or throw it out. 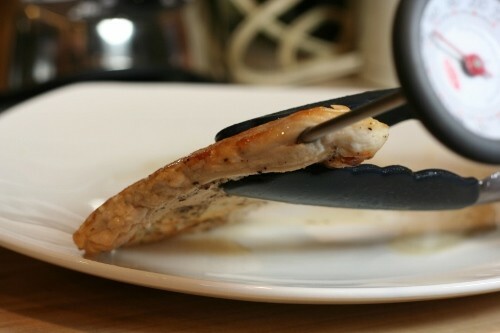 Cut the remaining v-shaped wing at the joint…just wiggle your knife in between so you don’t cut into the bone. Now each wing is in two pieces: the “drumette” (which looks like a baby drumstick) and the meaty “flat”. 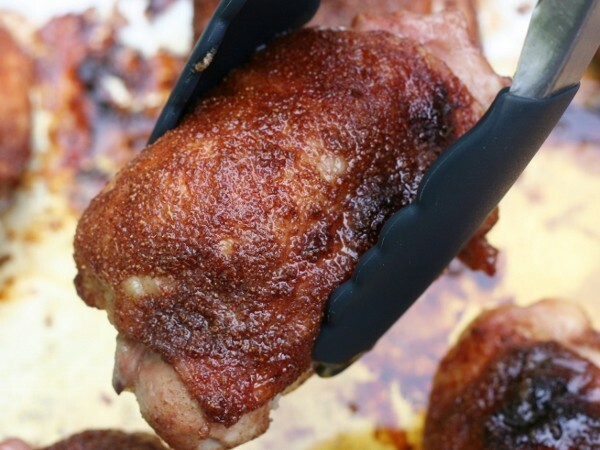 Depending what kind of eaters your friends are and what else you are serving, figure they will average about six pieces each…which means 1 pound of wings yields 4 servings. It is hard to stop eating these mildly spicy cherry wings, so adjust your math accordingly. Preheat the oven to 425 °. Coat a large rimmed baking sheet pan with cooking spray. Top with a wire rack (such as a baking cooling rack) and spray the rack. 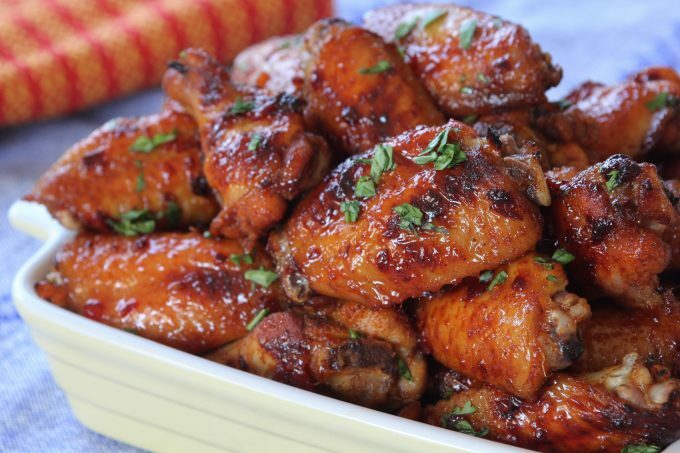 Combine the preserves, vinegar, garlic powder, salt and red pepper flakes in a bowl; toss with the wings. Arrange them in a single layer on the wire rack and bake in the center of the oven until cooked through, 25 minutes. Just before serving, sprinkle with the cilantro. 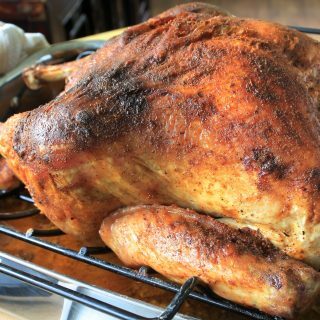 Want to learn all about chicken, from wings to breast to thighs and everything in between? 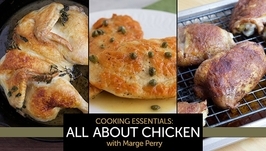 My online video class, Cooking Essentials: All About Chicken is available through the link just to the right for a special reader discount of half price.